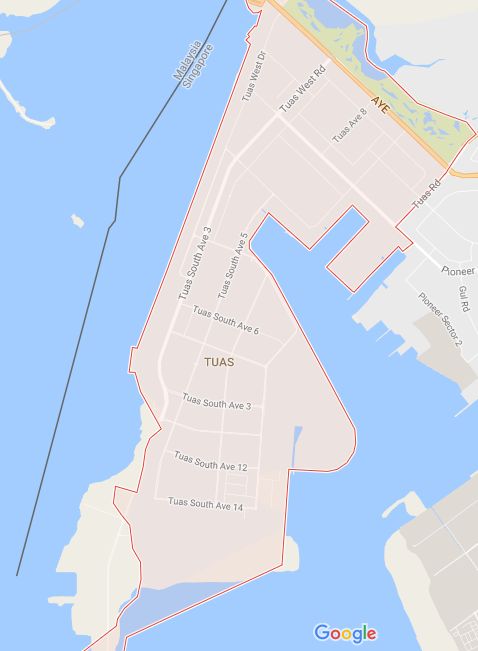 Tuas is an urban planning area located at the furthest coastal region in the western district in Singapore. The Tuas planning area is surrounded by the Western Water Catchment planning area towards the northern side, Pioneer New Town towards the eastern region, the Straits of Johor panning area towards the western region and also shares coastline boundary with the Western Islands planning area towards the eastern region. Tuas planning and residential area was initially a swampland which was first cleared to create a squatter settlement before becoming a fishing village in the mid 20thcentury. In the early 1980s, Tuas land was reclaimed from a fishing village to pave the way for more industrial and residential development. Since Tuas was located far from major residential areas as well as the commercial district of the western coastal line in Singapore, it was selected as the site to undergo industrial development. The decision to pick Tuas was arrived at because it was close to other industrial areas such as the Jurong Industrial Estate. Currently, Tuas is ranked second to Jurong Island when it comes to the presence of heavy industries. An example of Singapore’s heavy industry located in Tuas is the Tuas Incinerator, a large scale diesel renewable plant that utilizes palm oil as feedstock. Land reclamation is Tuas continues to create enough space and extend the Tuas planning area towards the South to construct an oil storage facility estimated to be the biggest in the world. Furthermore, construction activities at the Tuas mega port are underway. The Tuas Mega port construction projected to be finalized by 2040 is expected to be home to all the Port of Singapore Authority current assets and operations. The PSA expected to vacate its city terminals by 2027 and the Pasir Panjang Terminal by 2040 and move all its services to the Tuas Mega port that is currently under construction. Despite Tuas being a full industrial and commercial area, it has few residential buildings that only that provide low-cost accommodation to people working in these regions. Some of the industrial, residential estate in Tuas is located in Benoi Sector area which also doubles as the main eating place in the region. Other small industrial estates are located around Pioneer Road areas. The industrial estates comprise of low rise flats that are usually nine to eleven stories high and are named alphabetically. These residential estates are specifically constructed to cater for the basic accommodation needs of people working in the large industrial area. The main mode of transport in Tuas is railway with the region having four MRT stations on the East-west Line opened to serve the Tuas West extension into the industrial area. Tuas also has access to sea transport for export and import of industrial products and raw materials.